Finally, we got to the last sphere of Core set, which is Lore, and see what this sphere can offer us from the pool of heroes. The first one is named Denethor and has the interesting distribution of stats that we haven’t seen yet. 8 starting threat belongs to Spirit standard; however, in the Lore environment, I consider it for excellent starting threat value. 1 Willpower and 1 Attack won’t amaze, but 3 Defense is value, which we are looking at for the first time (at heroes, so excluding Beorn). 3 Hit Points is unfortunately under-average value, but if you want to defend some enemies with 2 Attack with a possibility of +1 Attack from shadow card or enemies with 3 Attack without counting of +1 Attack from shadow card (which is more hazardous), then Denethor will work quite decently. !SPOILER! In the future, count with the excellent attachment A Burning Brand. Denethor then will become an impassable barrier for the enemies. It depends, how much you boost his Defense. Dunedain Warnings works for this purpose perfectly – in a simple and effective way. Look at his action and you suddenly understand that only defending with Denethor would be a waste of his true potential. If you exhaust Denethor, you may look at the top card of encounter deck and move that card to the bottom of the deck, if you wish. This hero uses an encounter-deck-controlling strategy. If you know what comes from the encounter deck, you enter into DDD = Definitely Different Dimension. What can be more useful than knowledge of cards, which is going to come to play? It enables you to think and plan ahead. You can count with an exact threat, you can prepare for coming enemy, treacheries and locations and if it is crucial, you can move that card to bottom and let it be until the end of the encounter deck. Or until the moment you shuffle the encounter deck (which is more likely). Of course, if you decide to remove a card from the top of the deck, then you lose control of the encounter deck in the next draw. With Unexpected Courage attached to Denethor or another scrying card (Henamarth Riversong), you can extend the line of your scrying strategy. Everything I wrote is valid with one essential precondition: if you play solo. If so, then you’ll become scrying master. But in the multiplayer environment, Denethor works only partially. It’s still an useful ability, but with limited reach. 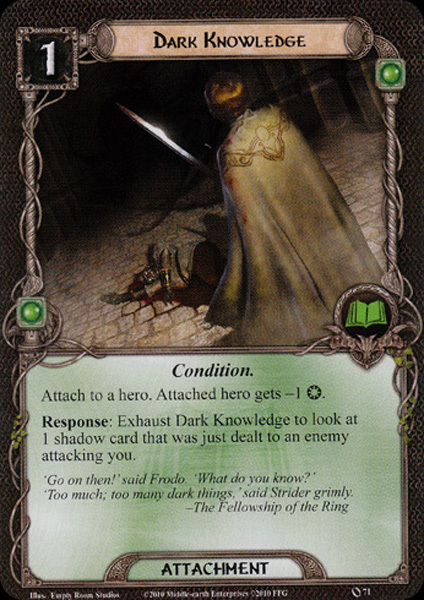 However, Denethor may use his ability not only before staging (quest phase) but even before dealing shadow cards to enemies (at the end of encounter phase). Shadow cards are another element of surprise, where you need to count with a variety of modifying effect, depending on a scenario. With Denethor, next shadow card won’t be unknown to you, yet you see only one shadow card, which would be dealt to one enemy. If more enemies engage you or your teammates, then you must find one enemy engaged with the first player and the enemy with highest engagement cost – this enemy will get shadow card as first. Using Denethor, in this case, is more complicated and it needn’t bring demanded effect. Let’s summarize it: Denethor’s ability shines in solo games, but in multiplayer its importance is decreased. And during your games, you might catch yourself that you use Denethor more as a defender than because of his ability. To our sight gets a resilient green warrior with majestic stats almost in every way. I would say Glorfindel is one of the few heroes, where you add him to your party due to his stats rather than due to his ability. You won’t be surely glad for 12 starting threat, which is very high, identical with the starting threat of Aragorn. If you decide for him, you should pick up two other heroes with lower starting threats. That’s a little bit limiting when you are choosing suitable heroes composition. For 12 starting threat, you gain 3 Willpower, which is one less than at Éowyn, the “queen of questing”. Still, he is the second strongest quester from Core set heroes. Next stat is also magnificent – 3 Attack can crush some weak enemy at once and in the group attacking his contribution is significant. OK, if the third stat was great, we would have overpowered hero, therefore only 1 Defense is understandable value. 5 Hit Points on the other hands makes from Glorfindel tough warrior. So some nasty damaging treacheries won’t cause him big trouble. You can fear only the big and strong enemies with high Attack. Now we finally open the discussion about his action, which says: “Pay 1 resource from Glorfindel’s pool to heal 1 damage on any character. (Limit once per round. )“ Pretty useful ability, isn’t it? Or not? The opinions differ in LOTR LCG community. One would say that healing 1 damage from any character (not only from heroes but even from allies, yours or others) and without exhausting Glorfindel is a very nice utility. For example, combo Glorfindel-Glóin works pretty well coordinated, Glóin from damage generates resources and Glorfindel heals his wounds, so you create something like Perpetuum mobile in LOTR LCG style. With Glorfindel on your side you, no longer you have to worry about fragile Éowyn or Eleanor. Even allies can draw strength from his permanent healing. So what’s the problem? From a global point of view healing of 1 damage won’t play a great role. You rather use some real healing event like Lore of Imladris, which helps you more significantly – for two resources you heal all damage from a character at once. For the same effect, Glorfindel would have to make much more effort. Another disadvantage of his ability you will find out immediately. That 1 resource for healing damage you will miss because we know that Lore has a big issue with resources. Everything in this sphere costs a lot of resources: allies, events and attachments. Even in a mono-sphere Lore deck, I have noticed that resources are a scarce commodity. And if you give up one resource voluntarily, which would be used for paying these expensive cards, then you will face a problem for sure. Steward of Gondor can naturally solve this trouble, however, this is general advice, how to improve resource generating of any card or sphere. 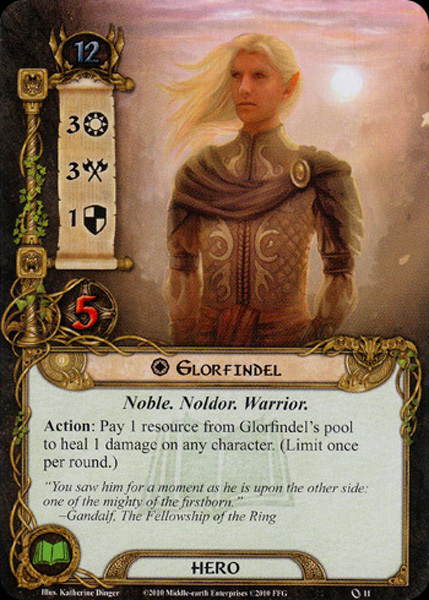 Without it, you will often decide between using Glorfindel’s action or save resource for playing expensive Lore cards. And so I think that Glorfindel is more useful just for his questing and attacking potential than because of his action. Our final hero of Lore sphere and simultaneously whole Core set belongs to a multifunctional character as Gimli or Aragorn. I understand it – after the best defender (Denethor) and second strongest quester and an excellent attacker (Glorfindel), the balance had to be established. And we start with 10 starting threat, which is the average value of both previous Lore heroes. It’s a good default value. When we see her stats: 2-2-2-4, we understand Beravor can fix any weak point in our games. Do you need more Willpower for questing? Send Beravor. Do you need to defend some attacking enemy? Send Beravor. Or on the contrary, do you need some extra attacking value for killing an enemy? Send Beravor. She is even more opened to play any role than Gimli or Aragorn because her ability doesn’t support any of these actions. !SPOILER! Although I think with the coming of Bilbo, who doesn’t need to exhaust himself in order to draw additional cards, Beravor’s position is not so monopoly from these days. That means in very, very close future from the Core set: specifically, from The Hunt of Gollum, the first adventure pack from Mirkwood cycle. However, using Beravor’s ability means one awkward thing: because of exhausting her you can’t use Beravor good stats for questing, defending or attacking. Or at least without Unexpected Courage, which is generally good for any hero, but for Beravor it is quite necessary. I often experienced a situation, where I have needed Beravor for other tasks than for cards drawing. And surely other players have experienced it too. It may be common trouble of all universal heroes with the ability that doesn’t correspond with any of their stat. You have to solve the dilemma: save her for the action, for which you chose her to your deck (cards drawing), or sacrifice her ability and use her somewhere else (questing, attacking or defending)? The answer isn’t easy, because it is strongly affected by the specific situation you are in. And in Beravor’s case, you will ask this question more frequently just because of her universal character. Daughter of Nimrodel is the first Lore ally, which comes to us for her own deep analyzing. And when we look at her cost and stats – the shock appears. 3 cost doesn’t belong to an insignificant value. For 3 cost I’m expecting the competitive ally with good stats, at least like at Horseback Archer. Okay, Lore sphere doesn’t overflow with high stats. but 1-0-0-1… really? Either it MUST have some super-ability, which compensates the non-existing stats, or I am MAD if I even consider about including this overpriced ally into the deck. I have to apologize to Silverlode Archer for what he has been criticized in his own review. With 1-2-0-1 he looks like super-ally, compared to Daughter of the Nimrodel. Hey designers, I really think she doesn’t deserve such tiny stats. One pity peck from Eastern Crows or brief look to the eye from The Necromancer’s Reach and Daughter of the Nimrodel say goodbye. That’s not something for what you would be willing to pay 3 resources. Perhaps her action can convince us about some usefulness. After exhausting her you can heal up to 2 damage from any hero on the board. Daughter of the Nimrodel represents one of the main features of the Lore sphere, which is specialized besides other things in healing. Basically, healing can be a profitable and supportive ability, which players can appreciate – if someone is willing to accept the role of “healer.” This is probably valid in many board games or computer games, mainly in MMORPG. 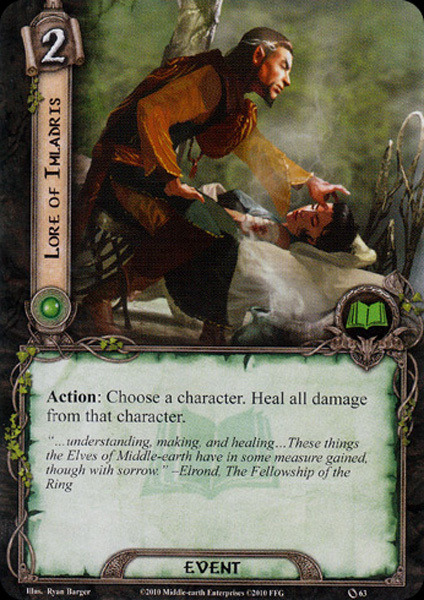 The problem is that not many players wish to possess the role of “healer.” Back to LOTR LCG, I am always glad for healing wounds of my heroes, I am calmer with some refreshed Hit Points because I am more distant from destroying of heroes. If the healing card has a nice and significant effect, then why not? My Glóin always needs good healers. Is Daughter of the Nimrodel good healer? The only perfect thing about her is that she can repeat own ability every round and she is able to heal 2 damage from any hero. The only payment is in form exhaustion (and that terrible 3 resources, of course :)). Unfortunately, nothing more is interesting about her – you can use her only for that healing. No chump blocking, which would cost you very expensively. No questing, which would cost you also very expensively, if you reveal for example The Necromancer’s Reach. And if you reveal Evil Storm and at the same time you have already hit the 35 threat, still this ally will leave you very easily. So my answer is: Daughter of Nimrodel could play the role of the proper healer – but you are investing in a risky “business”, which needn’t be worthwhile. The joy from her coming to a play can last very shortly and can change into frustration. From the reasons above I don’t use Daughter of the Nimrodel at all, no matter of her possibly Silvan synergy. I am convinced that we have better (and cheaper or more powerful) options for healing heroes, even in the Core set. Erebor Hammersmith is a Dwarf in services of the Lore sphere. While Daughter of the Nimrodel stands aside and could be considered for the forgotten ally, Erebor Hammersmith belongs to the most useful 2-cost ally of the whole Core set. I don’t remember which ally with such cost I have used more than him. !SPOILER! Winged Guardian is the closest better chump blocker for 2 cost, but for defending you are paying additional resources. Average (non-boosted) enemies with 2 attack don’t kill this ally in 1-2 rounds as we are used to it, same for 3-attack enemies, which destroy the majority of allies by the single smash. He stands a couple of attacks and that’s something I admire at a 2-cost ally. But that’s not enough and Erebor Hammersmith can show off his own ability. After you play him, you may return the topmost attachment from any discard pile. Sounds like solid ability, but new players may ask: can I utilize it in practice? I try to avoid discarding attachments as much as possible. Yes, same for allies and heroes, players do everything to prevent loss of these cards. But enemies are always present and you must agree some losses at your side. Heroes should be protected from the death on the first place. And as for the attachments, some enemies, treacheries or shadow cards can force you to discard some attachment (for example the shadow effects of Cavern Guardian, Driven by Shadow, Forest Spider etc.). And I’m not still talking about effects, which force you to discard card(s) from your hands or directly from your deck. In short, attachments will surely appear in discard piles. And if that attachment was quite useful or powerful, you can return it back to the game. I always enjoy the “resurrection” of Celebrían’s Stone or Unexpected Courage. And my friends can also profit from Erebor Hammersmith’s ability. Just don’t forget the only limitation, which strictly says “return the topmost attachment”, not any attachment. !SPOILER! 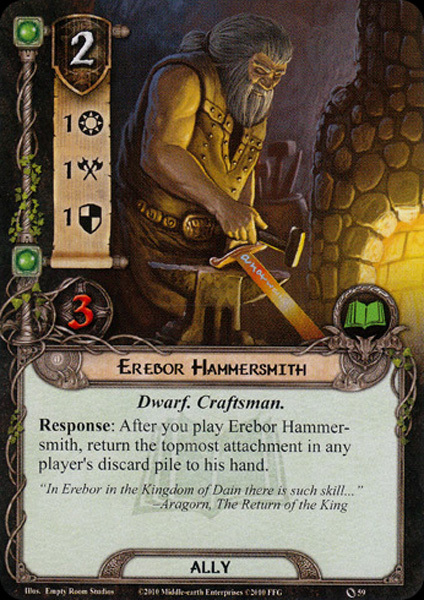 I want to mention cards, which can possibly work in combos with Erebor Hammersmith. Some attachments have the only “one-time” effect – after playing you must discard it. But with Erebor Hammersmith you can return it back and use it again: Ancient Mathom, Born Aloft, Good Meal, Miruvor, and many others. For 2 cost you have got the jewel among the allies across all spheres of influence, with above-standard stats and interesting ability, which sometimes come to use. Maybe not every time, you need to get into the advanced phase of the game, when discard piles contain several cards, including attachments. It’s also important to not waste the right time for using Erebor Hammersmith’s ability, because after you “cover” wished attachment by less useful attachment, then according to the effect, you must choose the topmost (that less useful) attachment. In every case, Erebor Hammersmith doesn’t get lost and choosing him into your deck is a great idea. The shining star in solo games, but more players are in the game, he is more and more fading away. In that way, I could describe Henamarth Riversong, one of the well memorable allies, which controls very decent ability depending on a number of players. Lore ally costs often more than you would wish, but this is not the case of Henamarth Riversong. He is able to help you immediately during the first round, thanks to his 1 cost. If you go through complete Core set and even next adventure packs, you find out that 1-cost allies belong to “endangered species”. Except for Snowbourn Scout, Core set doesn’t offer you any other ally with 1 cost. His stats are not bad – we are moving among 1-cost allies, who has around 2 OSS (= overall stats strength), so every single point of stat is a good bonus. Henamarth Riversong acts like the contributor in the questing effort (1 Willpower) and attacking effort (1 Attack). Without any Defense and with mere 1 Hit Point he dies immediately after getting any damage. 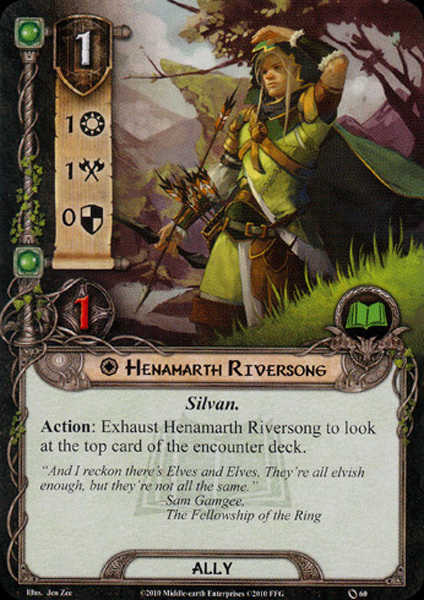 Before including him into your deck you should realize Henamarth Riversong is a unique character. So even after adding 3 copies of him, you must take into account that you can’t play more Henamarth Riversong at the same time. 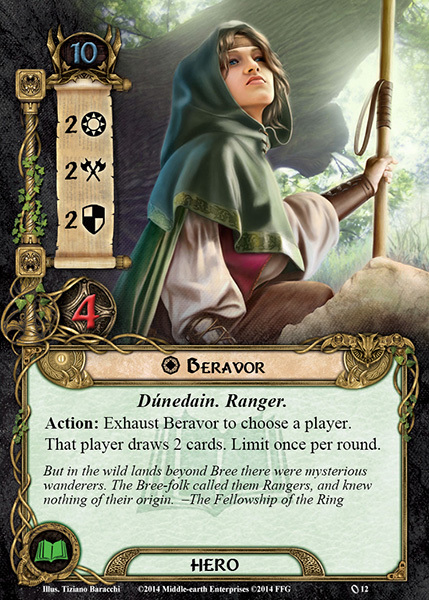 Believe me, from my beginnings I have often forgotten this characteristic, which is very uncommon in LOTR LCG – unique characters are commonly distinguished by higher cost (Brok Ironfist, Faramir, Beorn). His unique attribute makes a sense in connection with his action. You may exhaust him in order to look at the top of the encounter card. This is called “scrying” and I have met with this mechanic first in Magic the Gathering. It is a very useful ability, which enables you to foresee, what next appears from the encounter deck. It moves the game to another dimension because the ignorance of the encounter cards is the element of surprise typical for whole LOTR LCG (we can say the same about shadow cards). On foreseeing cards, you can build the whole strategy and you can react in advance. So the most logic usage of Henamarth Riversong is before staging (you can use his action before refreshing phase in order to avoid some troublesome treacheries like The Necromancer’s Reach, possibly revealing in next round). Knowledge of next threat strength is one of the most important aspects of scrying so you can adjust the questing effort. But also knowledge of treacheries, enemies, and locations themselves gives you a huge portion of advantage. I have tried Henamarth Riversong in combo with “master of scrying”, Denethor. 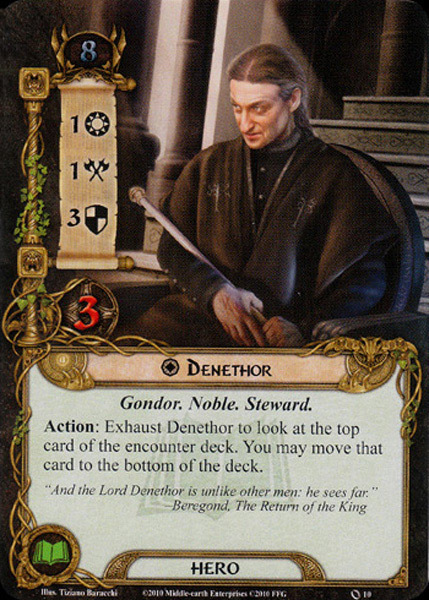 Denethor has the same ability, but moreover, he can move the scried card to the bottom of the encounter deck. It’s “upgraded” ability, and I have found out that it doesn’t cooperate with Henamarth Riversong’s ability too much. When you scry with Denethor and decide to not move a card to the bottom, then Henamarth Riversong won’t help you at all. Of course, if you move encounter card to the bottom, then Henamarth Riversong enables you to scry another card, with which you can’t manipulate, but at least you have the knowledge of that card. I think, that one scryer-character in a deck is enough. In a solo game, Henamarth Riversong is the super card, but in multiplayer scrying doesn’t work too effective. You reveal only the first card which comes, but you still have no idea, what comes beyond that card. That’s the weakness of Henamarth Riversong, therefore I use him rarely in my decks because I am playing only two-handed games. But I respect this ally as a useful addition to any Lore deck. Even without utilizing his ability you can count on him, thanks to his amazing 1 cost. 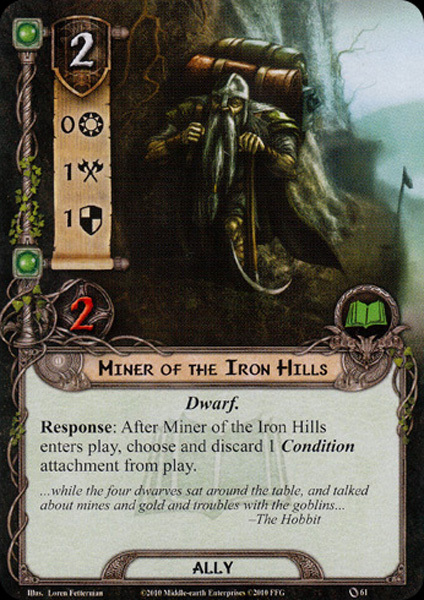 Now the second Dwarf ally is going to cross our way and I look forward to introduce to you Miner of the Iron Hills, very useful ally, who is able to help you in specific situations, with specific encounter cards. As I am often saying or thinking that cards with very specific effects “could be under some circumstances good, but it depends on the concrete situation and it is not good in every scenario, or deck, or strategy etc.,” just forget it for now. The ability of Miner of the Iron Hills works very perfectly, despite his “non-versatility”. For 2 cost you have got no Willpower at all, but otherwise, you can enjoy 1 Attack, 1 Defense and 2 Hit Points. Not so marvelous as previous Dwarf, Erebor Hammersmith, still I think he doesn’t offend you. In other words, any point in Defense for 2-cost ally deserves a thumb up. Miner of the Iron Hills can hold the post of chump blocker quite satisfactory. I would like to primarily describe his response. When he enters the play, you may discard any 1 Condition attachment from the game. First question from rookies: what are Condition attachments? In Core set you have surely met treacheries, which behave as “encounter attachment” – Caught in a Web is such example of this kind of cards. These troublesome cards have the opposite effect of player’s attachments – they are just disadvantaging you. Caught in a Web makes from your hero “cocoon”, unable to be ready unless you pay 2 resources. Spending additional resources for one readying? Meh, if the hero doesn’t control Steward of Gondor, which would neutralize the effect of Caught in a Web, then your hero becomes a useless cripple. Miner of the Iron Hills is able to destroy this Condition and restore hero’s usefulness. I should mention in short that every Condition is also treachery. In other words, you are able to cancel it by Eleanor’s ability or by the effect of A Test of Will. Eleanor and A Test of Will serve as prevention. Miner of the Iron Hills fights the fire if prevention is not present. !SPOILER! Oh, how many times I had to pick from sideboard Miner of the Iron Hills because of Sacked!, which can totally paralyze your hero. Or such Watchful Eyes, which causes something like involuntary Surge. His ability is unique in the game, so he has specific, but irreplaceable role. He won’t be the superstar in every scenario (where he serves as an average ally with average stats), but where Conditions appear, you may rely on Miner of the Iron Hills. When I see the last ally from Lore sphere (and from the Core set at the same time), I consider as quite interesting fact that we meet in the same sphere the second low-cost unique ally. You know, I think that uniqueness commonly belongs to some high-cost, pretty powerful and significant allies. But Gléowine is a quite inconspicuous fellow with weak stats. However, as we have been convinced many times before, ability beats the stats and makes this card useful. Gléowine costs 2 and has 1 Willpower, no Attack and Defend, and just two Hit Points. Okay, his stats wouldn’t be absolutely the reason, why should you add him to your deck. 1 Willpower won’t save you and 2 Hit Points actually neither. Well, Rohan trait could indicate that the questing might be the possible alternative role for Gléowine but read his action and you should refuse to waste his potential for common questing: exhaust him, choose a player and that player will draw 1 card. Now you should understand his unique icon because drawing 3 cards due to 3 copies of Gléowine would endanger the fragile balance of the game. Actually, you have got drawing card for free – 2 cost is good, easily attainable value and exhausting is the proper cost. No such things like “pay 1 resource,” “discard Gléowine,” and other variants of cost, which occur quite commonly. I see him as a good alternative to Beravor. With her, you are able to draw two more cards, and without paying an additional 2 cost. However, realize she is a hero, moreover with the set of stats, which are usable in other aspects of the game. The exhausting of hero in other cases than questing, defending or attacking is always tricky because often you must give the priority to mentioned actions. For using action doesn’t remain free place and time (if you don’t control Unexpected Courage, a cure for everything :)). This is not the case of single-purpose Gléowine. He is specialized for drawing cards and if you are not in trouble, where you need to sacrifice some ally as a chump blocker or you need very urgently every single point of Willpower in the questing, then you will use him only for what he was predestined. Only a few allies can boast of such a single-purpose. Of course, if you want to build a strategy on the basis of cards drawing and having options as much as possible, combine Gléowine’s ability with that Beravor’s and you can draw up to 3 cards (4 cards with the counting of resource phase). 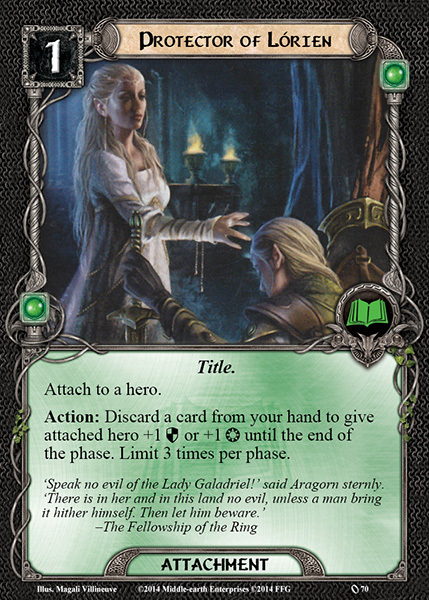 These permanent versions of drawing card may be supplied by events like Lórien’s Wealth or Valiant Sacrifice. Gléowine becomes good support and reliable ally in your services. He doesn’t help you in any other tasks, but for the questing, attacking and defending choose other, more suitable allies. He can do one thing, but very well. Yeah, I think that our last ally from Core set doesn’t make a disgrace. Lore allies have begun with the healer Daughter of the Nimrodel. Lore events are beginning same – Lore of Imladris has also healing effect. The difference between them is… significant. Let’s start another analysis. For Lore of Imladris, you have to save 2 resources and you choose this event in a situation, where you need to heal damage from any character. All damage. For this action, you may target a hero as well as an ally. It’s nice to have free choice here, though only a few allies deserve to be healed. I can mention Northern Tracker or Beorn, allies with stats of heroes and great abilities. It would be shame lose them in battle or due to some effect. Nevertheless, I suppose Lore of Imladris was primarily designed for heroes, because with every damage on them the possibility of losing of hero is increasing and therefore your game could become much complicated. In blunt terms, the losing of hero often means game over. And it is worth it to protect them from dying as much as possible. What can be better than removing all damage tokens from the endangered hero? To not get any damage. :) But you know, sometimes it is necessary to get some (due to defending) and sometimes you have no choice. The damage can come without warning. With the holding of Lore of Imladris in your hands, you may stay calm and relaxed. If you don’t play any scenario with encounter set Spiders of Mirkwood, where hides one treacherous copy of Eyes of the Forest, save this event for the case of emergency (Eyes of the Forest was just one example, of course, you meet much worse encounter cards through next adventures packs and expansions). It’s interesting that for some heroes is Lore of Imladris key card due to their effect, and for some heroes, on the contrary, this card is inappropriate. To the first group belongs, for example, Glóin with his resource-generating ability. Lore of Imladris should target him at most. 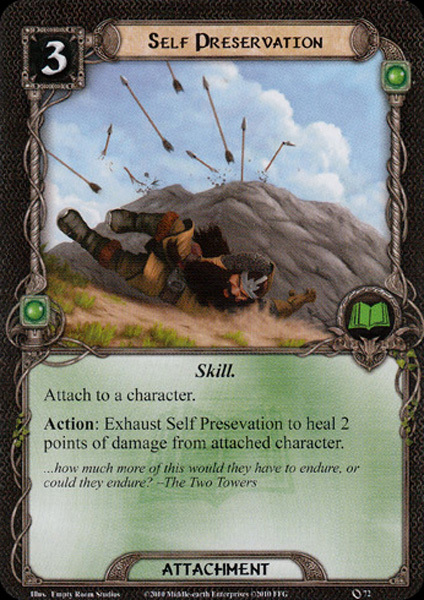 However, such Gimli won’t thank you for healing him – every damage on him boosts his Attack and if he is not one damage before K.O., then Lore of Imladris “resets” his immense power to default values. From this view, use a more limited healing effect like Daughter of the Nimrodel or Self Preservation, with which you better control the amount of healed damage. But Gimli is more exception. Majority of heroes like Aragorn, Éowyn, Legolas or Beravor welcome Lore of Imladris as salvation, if they bleed really badly. I include Lore of Imladris into a deck if I play scenario with strong and nasty damaging treacheries, and/or with some powerful boss. The presence of Lore of Imladris can be in these cases necessary, but the best thing you can do is playing safely and with control, without relying on the help of this event. It’s a great sideboard card if the encounter deck has in repertoire some cards, which are able to deal damage to your heroes in high style. !SPOILER! I would say that at least A Journey to Rhosgobel isn’t playable without the healing effects. Here, Lore of Imladris is the best card you could draw. As a part of your main deck, you won’t utilize Lore of Imladris in every scenario (if you don’t dive in head first to every battle) so as I said, save it for the sideboard and you won’t be disappointed. The next event, called Lórien’s Wealth, is for me a symbolism of high costs of the Core Lore sphere. Though we find in Lore some cheap cards like Henamarth Riversong or Secret Paths, I have always a problem with payment of cards, which are more expensive than 2 cost. But in fact, there is nothing bad about the ratio of cost to a given effect. For 3 cost we choose a player, who draws 3 cards. 3 cost for 3 cards – I would expect such an exchange. Here I’m fine with it. Also getting 3 cards at once is a very nice supportive effect. 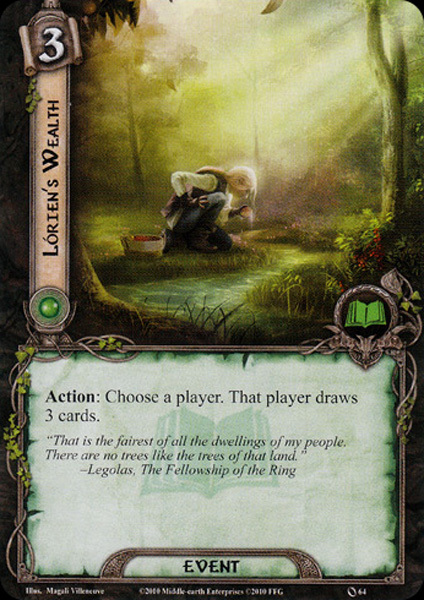 I see this Lórien’s Wealth as a good event in the late game when you are holding only a few cards (or your hands are absolutely empty), you have the pile of unutilized resources and you lack some options. If you don’t own Beravor, which would help you with drawing cards, then Lórien’s Wealth comes very handy. And it’s also true for any player, so you can utilize it as well in solo games as in multiplayer games. However, how many times you get into such favourable situation? More probably you will fight with every single resource (especially in the Lore sphere) to pay some allies, events, and attachments. Without Steward of Gondor, Théodred or other resource-generating cards, Lórien’s Wealth will wait in your hands to the right moment, which may not ever happen. Unfortunately, I have experienced this many times – in good faith that this event will help me to extend choice, I had to do other and more important things and Lórien’s Wealth has stayed in hands totally in vain. I know that this event could be fine, even with the weaker effect, but for the lower cost at the same time. 2 cost for 2 cards? That’s more accessible. We would get 1 card less, but we wouldn’t have to save so many valuable resources. And believe me, 2 versus 3 cost in the Lore sphere is a significant difference. !SPOILER! 1 card for 1 cost has already existed, but in the Leadership sphere, as Campfire Tales. But we will also get a far more usable card, called Daeron’s Runes. Free cost for 1 card (after drawing 2 cards and discarding 1 card)? Man, that’s an amazing effect! Interesting thing is this card belongs to Lore sphere. Lórien’s Wealth compared to Daeron’s Runes looks like badly done, expensive relative. I have tried really hard to find a good use for this event, in various decks with various strategies. I know its supportive power in “no-options situations”, I fully understand the 3 cost for 3 cards and I’m happy for its flexibility in games with more players. However, until these days I had to remove Lórien’s Wealth from main decks to sideboards, where it has finally ended without any utilization. Beravor and Gléowine with similar effect have always beaten Lórien’s Wealth. I can’t recommend you this expensive Lore event, I’m sorry. Better keep it aside and include some cheaper, more powerful and/or more important events. Now we meet two events, which have almost the same effect, but still that small difference, which distinguishes them, predicts their different usefulness. Though the reviews could be almost the same for both cards, I try to aim at the differences between them. And I’m beginning with Radagast’s Cunning, which I know less. It has 1 cost so we won’t have any problem with its playing, and it has quest action: “Choose an enemy in the staging area. Until the end of the phase, that enemy does not contribute its Threat Strength.” In the progression style, this is the first card with such kind of effect, but quite important: temporary “canceling” of Threat Strength of the encounter card, in this case, Threat Strength of an enemy. So, what’s its effect good for and when it is most necessary? Staging is a quite tricky phase of the game. Excluding effects of treacheries, “When revealed” effects and other troubles connected with revealing new encounter cards, Threat Strength is the most important aspect of the questing phase. It should interest you in the first place because failing in questing causes the increasing of your threat and can trigger some other secondary, no less troublesome effects. And if you don’t hold Secret Paths, which solves the Threat Strength of locations, then you can neutralize Threat Strength of the enemies. In Core set, we encounter some enemies, which deserve our attention due to their high Threat Strength. In Passage Through Mirkwood, it begins with East Bight Patrol and disgusting Ungoliant’s Spawn, which threatens our questing effort. Scenario Journey Along the Anduin introduces us giant Marsh Adder and in Escape from Dol Guldur, we will flee before Nazgul of Dol Guldur. All these creatures contribute to overall Threat Strength to a great extent, so Radagast’s Cunning should be saved primarily for them. 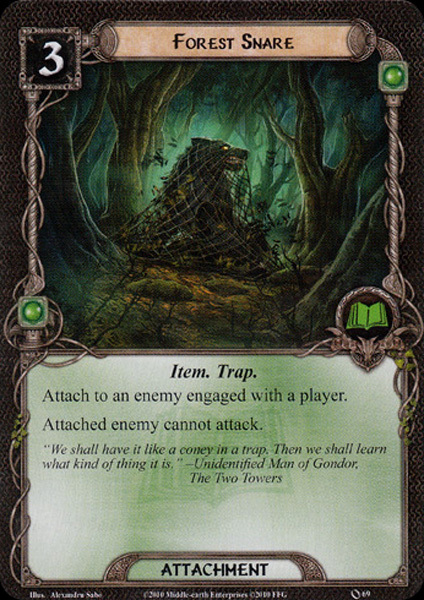 And now I will explain to you, why Radagast’s Cunning isn’t so important in your deck in comparison with its “relative” Secret Paths, which neutralizes the Threat Strength of the locations. I won’t question that Threat Strength of enemies could get you in a troublesome situation. However, realize that after one staging you are commonly allowed to encounter enemies thanks to “player engagement”. Excluding some very specific moments in some scenarios and enemies like Goblin Sniper, you can effectively decrease the Threat Strength in the staging area by simple and voluntary encountering the chosen enemy. And if you don’t want to encounter some enemy because you aren’t prepared for a fight, then still you probably encounter some enemies with lower Threat Strength than is your threat during the “engagement checks”. In short, with a couple of enemies in the staging area, you encounter some of them, not depending if you want or not (if you don’t run some Secrecy deck). This also prevents something like “enemies lock”, the situation with an uncontrolled number of enemies in the staging area, which hardly occurs by itself (as I said, only specific part of scenario can force you to not engage enemies according to common rules, like Anduin Passage in Journey Along the Anduin). Because you can get rid of Threat Strength by simple encountering enemies, then I see Radagast’s Cunning as the not necessary event. “Enemy lock” doesn’t threaten you in the normal case, so if you can handle at least one round with enemies in the staging area, Threat Strength resolves by itself. But if you play knotty scenario with a great number of enemies with high Threat Strength, or you just want to try this event, there shouldn’t be anything to stop you from the experimentations with Radagast’s Cunning. As I briefly mentioned in the previous review of Radagast’s Cunning, there is the second Lore event with similar effect, but instead of neutralizing of enemy’s Threat Strength, we will aim Secret Paths on location. 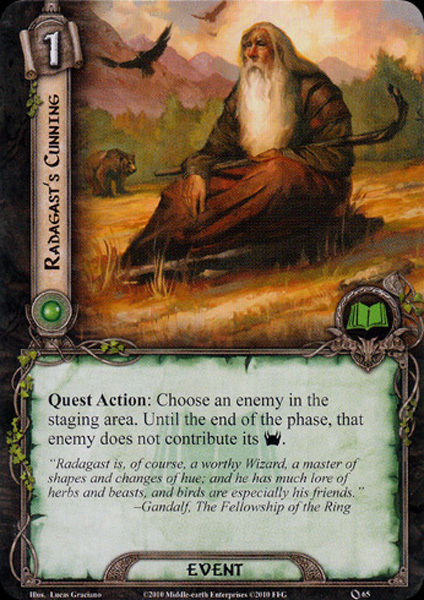 Everything else is same as at Radagast’s Cunning: 1 cost, quest action, targeting card in the staging area and “one-time cancelation” of Threat Strength of chosen card until the end of the phase. As I pointed earlier, neutralizing of Threat Strength in the staging area is a very helpful thing, because it partly protects you from increasing own threat value. Secret Paths enables you to aim your attention to locations, which contribute to overall Threat Strength to the great extent. In Core set, we have “only” 3 locations with higher Threat Strength than 2: Gladden Fields, Necromancer’s Pass and The Brown Lands. Even average Threat Strength of all locations doesn’t differ from the average Threat Strength of all enemies: 2.08 vs. 2.00. Then why we should be more afraid of Threat Strength of locations than of those enemies? Because of “location lock.” I would say that “location lock” is one of the most common reasons, why players lose their games. Yes, you may be overrun by a number of enemies, which destroy all your characters. But location lock causes you lost in another way: by simply increasing your threat. You are dangerously getting closer to “ending-threat value” of 50, and as the side effect, you are encountering more and more enemies, with higher and higher Threat Strength. As you see, “location lock” is a very dangerous situation, which you must solve quickly, or you might be overrun by locations without any chance to quest successfully. And in comparison with enemies, you can’t “encounter” location and therefore decrease Threat Strength so easily. You must travel to locations one by one. Or include some cards, which put additional progress tokens onto locations – cheap “first-aid” Snowbourn Scout, little bit complicated Strength of Will, or mighty Northern Tracker. What does it have to do with Secret Paths and its effect? In my point of view, neutralizing of location’s Threat Strength is far more urgent than Threat Strength of enemies, because you won’t get rid of locations in an easy way. Therefore, proper using Secret Paths on the chosen location enables you to decrease overall Threat Strength in the staging area in order to put some progress tokens on active location, thus possibly explore that location, make a free place for new location, travel into that location and so decrease overall Threat Strength in the staging area. Isn’t that complicated too much? It maybe looks like, but it has very practical using. Your goal is to complete all parts of scenarios through questing successfully and so generating the sufficient number of progress tokens. Because the appearance of enemies with high Threat Strength can be resolved by simple “player engagement”, locations must be resolved at least temporarily by neutralizing of its Threat Strength or by other effective ways. As I said before, “enemy lock” is a very rare situation, but “location lock” threatens you almost in every scenario, even every round under some circumstances. That’s the reason, why I prefer Secret Paths to Radagast’s Cunning. 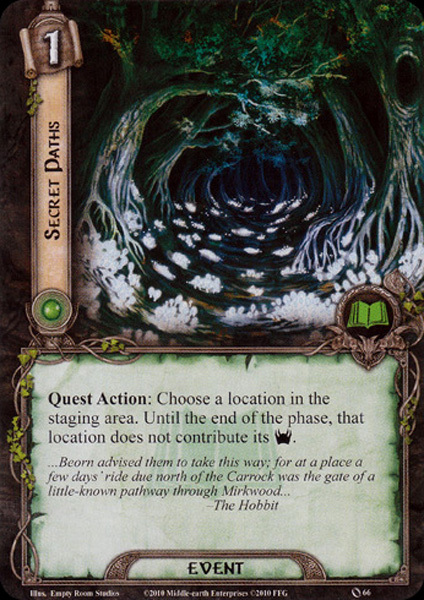 While I know Radagast’s Cunning very marginal and used its services only in my beginnings with Core set, I make a free place for Secret Paths very often in Lore decks. If you can manage the threats of locations in other ways, then Secret Paths is not so necessary. But from my sight, Secret Paths is a valuable and reliable event, which come in handy every time you draw it. After many events with very simple effects, we have finally got a much complex event, Gandalf’s Search. This a little bit unknown and forgotten card also deserves own review and maybe even partially justification. It’s the second (and last in the Core set) card with X cost (the first one was a Spirit Stand and Fight). That’s a tricky issue. You may pay 1 resource as well as 5 resources, thus strengthen the potential of the concrete card. The question is if Gandalf’s Search is s good card for any cost. Its action allows us to look at the top X cards (where X is paid resources) of any player’s deck. One of the revealed cards remains in hands of its owner, the rest of them you return to owner’s deck in any order. The first thing that comes to my mind is “alternative to Lórien’s Wealth”. Are you unhappy with that 3-cost event? Use Gandalf’s Search – pay 1 resource and draw 1 card. That’s the fact, which players don’t often realize. Of course, they want to utilize Gandalf’s Search at maximum and pay 3, 4, 5 or even more cost and then whine, how much this event is expensive and unusable. But listen, new players (or think about it more, you veterans :)) – if you don’t want to pay a pointless number of resources, just pay 1 and draw 1 card. I don’t see anything bad about it. However, we shouldn’t forget the real power and purpose of this event. The true essence of Gandalf’s Search lies in the possibility of reorganizing of your or other’s deck. In other words, prepare at least 3 resources for the effective using of this event (2 resource is somehow odd cost – you choose 1 from 2 cards, then put the remaining card to the top of a deck. No true reorganizing happens). 3 and more cost allows you to use sort of strategy, for which Lore sphere is well known and you surely meet other cards with a very similar effect – deck control or deck manipulation (I see that this term doesn’t exist in the community, maybe it has own and better-known term). !SPOILER! If you want to know some other examples, remind cards like Master of the Forge, Word of Command or Gildor Inglorion). Scrying of your own deck (or another’s deck) and manipulating with the order of cards belongs to an interesting strategy, which increases your chances to get some desired or necessary card. More cost, deeper scrying. In the situation, where you badly need to draw some “saviour” and you have a lot of resources, which you can spend, Gandalf’s Search can help you in your effort, of course with some sort of uncertainty. The worst thing that could happen is finding no useful card at all. And how to order cards right? It strongly depends, as always, on the specific situation. Do you need some defenders? Draw 1, rest of them put more to top of your deck. Do you need some attachment to boost some stats of heroes? Draw 1, rest of them put more to top of your deck. Do you need some event, or specific card, which can get you out of your trouble? Then good luck in searching and finding the right card. As you see, Gandalf’s Search is the tricky event, which can help you as a miracle, or show you the unpleasant truth about which bad cards are waiting for you. Paying many resources for “showing unpleasant truth” doesn’t belong to the best investments in LOTR LCG. Therefore, I understand the frustration or absolute ignorance of Gandalf’s Search in the community. To be honest, I was also playing Gandalf’s Search in my beginnings and then maybe in some test deck, but I have quickly removed it from my main decks. 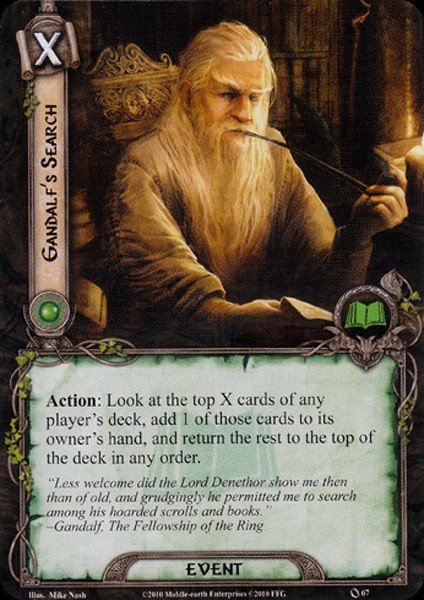 However, if you don’t mind to use Gandalf’s Search as a cheap card-drawing effect, then it would be the shame to not use it in this way – 1 cost for 1 card is a good exchange. All spheres have own “elite events” – very expensive and powerful cards, which should influence the game significantly. Beorn’s Hospitality is that elite event for the Lore sphere. Is it expensive? Definitely. Is it powerful? Maybe. Is it useful? I hardly doubt it. 5 cost in Lore sphere means almost impossible challenge – saving 5 resources in a right time. I think that some of your Lore heroes must be attached by Steward of Gondor, or you must build Lore-monosphere deck. 2 and fewer Lore heroes significantly decrease the chance of playing Beorn’s Hospitality, because you have to save resources for other, very important allies, events, and attachments. That’s the first negative of this card and we haven’t started with its own effect yet. How generous is Beorn’s Hospitality? You can heal all damage from each hero. That’s amazing! But wait… of one chosen player. Do you mean it seriously? 5 cost for healing all damage of heroes of only one player? That’s a horribly expensive card with a bad exchange. Healing all damage of each hero would be the super effect, I admit. There are some scenarios, where you appear in bloody battles with great enemies like Hill Troll or Chieftan Ufthak, and your heroes suffer from serious wounds. Some of them may be close to death. Drawing Beorn’s Hospitality might look like a wonderful miracle in that situation. However, if you need a help of this event, then you probably have lost control upon your game long ago. And losing control upon your game isn’t characterized by having an excess number of resources. Thus it’s very unlikely that you will possess a sufficient amount of resources in order to play Beorn’s Hospitality. In addition, you have to choose one player, whose heroes will become fully healed. Other players and their heroes remain untouched by this event, absolutely ignored. The sad truth is you can handle with missing Hit Points by far cheaper and also better cards. Lore of Imladris heals fully only one hero, but for incomparable 2 cost. 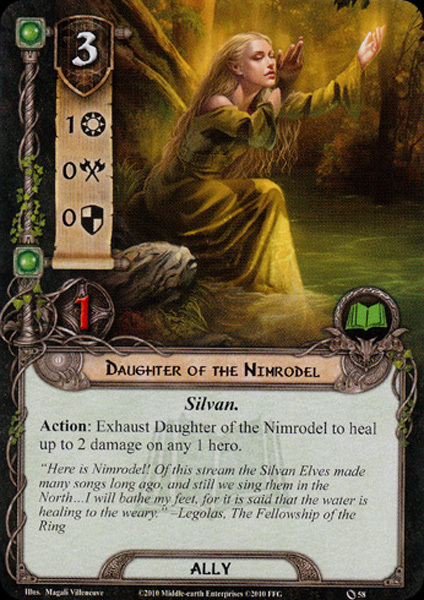 Daughter of the Nimrodel costs 3, I consider her as an expensive ally – but in comparison with Beorn’s Hospitality, you at least get a card with permanent effect. Each round you are allowed to heal 2 damage. And Self Preservation? It is attachment version of Daughter of the Nimrodel, but immune to effects of treacheries like The Necromancer’s Reach (though endangered by “discarding-attachment effects”, mainly in form of shadow effects like Cavern Guardians). I should mention Glorfindel, but I don’t see him as a capable healer. Still, all these cards have some usage in practice. Beorn’s Hospitality lacks any practical using. We have met one of the worst cards in the Lore sphere, probably even in the whole Core set. Its hefty cost for a quite weak effect makes this event really useless in any meaning. 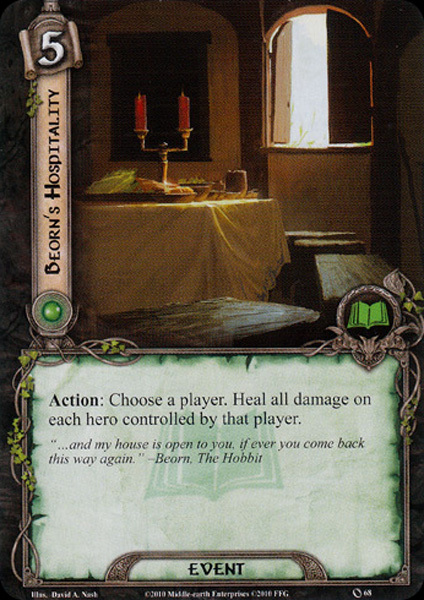 Any healing card does better its own work than Beorn’s Hospitality. I’m hardly imagining to put this event in any of deck. And LOTR LCG community shares similar feelings like me. It’s the level of Power in the Earth, Rain of Arrows or Lórien Guide, that means the group of cards, which you will very likely ignore from the beginning and you will never hear about them more in future. However, even these cards belong to LOTR LCG and we must accept their odd existence. Forest Snare isn’t a common attachment. We are used to attaching our heroes and boosting their stats or adding them some special ability. Forest Snare goes another path – it attaches enemies and gives them some negative effect. Attachments in the Lore sphere can be divided on cheap and expensive – nothing between it (understand with 2 cost) exists in the Core set. Forest Snare belongs to expensive attachments. It’s not somewhat dramatic, but you must count with 3 cost to play it. As I have pointed, you attach Forest Snare to an enemy. It must be engaged with any player and it makes from enemy easy, powerless target – enemy can’t attack you. It is something like permanent Feint. Attaching anything else than heroes is quite uncommon. Power in the Earth is an example of attaching location, which gains -1 Threat Strength. Forest Snare is our very first enemy-attachment. I like the idea, that we have own answer to Conditions, treacheries which behave as an antipole to player’s attachments. You want to make a cripple from my hero by revealing Caught in a Web? Eat this! (and you throw Forest Snare on the mischievous enemy). !SPOILER! worse cousins of Hill Troll, Louis, Stuart, Rupert and Morris are very attractive targets for Forest Snare. It wouldn’t be fair if I conceal from you some difficulties connected with Forest Snare. Firstly, you can use Forest Snare, when an enemy is engaged with you. On the first sight there isn’t nothing weird about it, but think – you are able to play attachments only during the planning phase. Enemies encounter you more lately. After encountering they attack you. You must wait on your opportunity until the next round – that is the planning phase. What does it imply? You have to survive one round without help of Forest Snare. This is a bit disadvantage of this attachment – you have to manage with the first attack in order to catch the enemy in a trap. Here I should mention one exception, which enables you to “bypass” this precondition. It’s actually combo – Son of Arnor + Forest Snare. The principle lies in playing Son of Arnor during the planning phase, that causes dragging of the desired enemy to your engagement area, then you can catch the enemy by Forest Snare. Secondly, not every enemy can be caught by Forest Snare. They can be just too wild and dangerous, that Forest Snare won’t help you. Look at Nazgúl of Dol Guldur after errata: No attachments can be played on Nazgúl of Dol Guldur. He is absolutely immune to Forest Snare. And be certain that the most powerful enemies will possess this ability. Thirdly, it’s not the disadvantage but notification: don’t forget to deal shadow card to th caught enemy. It’s easy to forget it, but you deal shadow card to an enemy in every situation, even if you prevent that enemy to attack you, according to official FAQ: At the end of the combat phase, discard each unresolved shadow card in play. (Do not resolve the effects on these shadow cards). I welcome the existence of attachment like this. Lore sphere prepares to us the surprise in form of Forest Snare. On weaker and average enemies with insignificant stats is Forest Snare quite a waste of resources. When the big and dangerous creature appears, it is time to set a trap for it. Forest Snare has never disappointed me and I believe that players will appreciate its uncommon effect. Are you searching for any stat-adjusting attachment, event or even ally? Some additional Willpower, Attack, Defend, Hit Points? Every sphere has its own set of cards with the effect like this. But in Lore sphere, you would search vainly – assuming that you won’t pull out from card pool Protector of Lórien. It costs 1 resource, you attach it to a hero, who gains new action: “Discard a card from your hand to give attached hero +1 Defense or +1 Willpower until the end of the phase. Limit 3 times per phase.” I think that the Lore sphere doesn’t excel in questing or defending, actually not even in attacking. Remember Daughter of the Nimrodel, Miner of the Hills, Gléowine or others – nobody is the natural-born warrior, defender or quester. Their lack of stats compensates heroes like Glorfindel (good quester and attacker) Denethor (good defender) and Beravor (solid in every action, but not specialized in any of them). Without supporting from allies they can be boosted at least by Protector of Lórien, which increases either Willpower or Defense. Yes, increase Willpower or Defense – such a choice and flexibility we haven’t seen at attachments yet. Attach it to Éowyn, queen of questing. Not only you can use her own ability to boost her Willpower by discarding a card for every player in the game. You are also enabled to make her Willpower even bigger with Protector of Lórien, more precisely by adding +3 Willpower during one phase. But maybe you rather boost Defense for some hero, for example Aragorn. He’s the great hero, with 2 Defense and 5 Hit Points, but honestly, 2 Defense won’t save you from the toughest attacks. Do you plan to make Aragorn more resilient? Add him Protector of Lórien maximum +3 Defense and I guarantee you that 5 Defense stops even the bosses. From Hill Troll becomes just annoying insect (truth, without the shadow effect), Nazgúl of Dol Guldur or Ungoliant’s Spawn (also without shadow effect) even leave you unhurt. I could mention many good examples for good using of Protector of Lórien, but in general, you should target more multifunctional heroes, who can do a good job in questing and defending and increase their potential even higher. However, Protector of Lórien can help such heroes, who on the contrary miss good quality in chosen parameters. You want to see happy Théodred and make from him perfect quester, for what he was originally born? Or do you want to more control damage, which comes to your resource-factory, Glóin? Have some! What you could utilize is limitation “3 times per phase.” In theory, if your hero possesses Unexpected Courage, you are free to commit a hero to a quest with maximum +3 Willpower, boosted by Protector of Lórien, and after that, you are able to use this attachment again to boost same hero’s Defense up to 3. Sounds enormously useful, but you can’t forget on price – discarding a card for every single boosted stat. Even if you have Beravor, Lórien’s Wealth and Gandalf’s Search on your side, you are limited by resources, by suitable options at that moment and of course by the number of cards in your hands. I have never tried the strategy with the maximum number of drawing-effect cards in order to maximize the effectiveness of Protector of Lórien (because it is not unique, you can attach 3 copies of this attachment), but discarding many cards in order to “feed” the power of it? I think that it looks better on the paper than in real games. I didn’t use this attachment very often, despite its significant usefulness. For me, it was an arguable card, for which you needed to “feed” this attachment by a large number of own cards. When I have come back to this card and give it a chance again, I was very surprised, what card I let rest in the box. The Lore sphere lacks for Willpower definitely. Protector of Lórien is the partially answer, how to compensate this deficiency to a certain extent. Boosting up to +3 Willpower means the great help in a questing effort. On the other hand, boosting up to +3 Defense gives you certainty during the combat. The only price except for 1 resource is the sufficient number of cards, which you can miss. Thus, if you run the Lore deck, this attachment shouldn’t be ignored. Knowledge is power. You have surely heard this already. It’s true in LOTR LCG as well, because if you know some secret, you are advantaged, you control the game to some extent. But if you have Dark Knowledge, be sure you must pay (understand “sacrifice”) more than just resources. After all, the picture of this card illustrate this perfectly. 1 cost for Dark Knowledge is the cheapest price of Dark Knowledge. The second cost is quite weird – attached hero gets -1 Willpower. When I have read it at first, I asked myself: “For what is good such an attachment? I need to boost my stats, not their reduction!” Yeah, for what we are paying 1 cost and -1 Willpower? For knowledge: after dealing shadow card to some enemy, which is attacking you, exhaust Dark Knowledge in order to look at that shadow card. Just look – no removing is allowed. Though I must say you have obtained the great attachment, which allows you to gain knowledge of dealt shadow card. It has wide utilization. How many times you would pay any price for knowing, what shadow card is hiding under the chosen enemy? Shadow cards actually can cause the death of your allies, heroes, discarding attachments, cards in hands, removing resources and many other effects. Some of them you can’t influence by Dark Knowledge and what must happen, it happens. BUT let’s look on example for all: would you defend attack of Hill Troll with shadow effect from Wargs (+1 Attack defended, +2 Attack undefended) by Gimli with default Defense and Hit Points? No, you would just lose Gimli! Then you rather sacrifice another character (most probably the ally) even for the cost of additional increasing of your threat. In other words, knowledge of adjusting Attack of Hill Troll changes your mind and you rather defend with someone less valuable. Knowledge of the shadow card can change your behaviour. You have to also count with that additional cost -1 Willpower. So you won’t attach Dark Knowledge to Éowyn and uselessly restrict her in that she is good in, will you? You should choose a hero for attaching Dark Knowledge carefully. In Core set, for example, you should think about Eleanor, Denethor, or Legolas – these heroes would be hardly committed to a quest. If you want to have your “dark knowledge” about my opinion on this attachment, then I confess Dark Knowledge is the weaker “Lore brother” of Hasty Stroke in Spirit sphere. Dark Knowledge is “more permanent” card (it’s an attachment, not an event), however Hasty Stroke cancels the effect of shadow card completely, without any discussions and compromises. !SPOILER! Additionally, the Lore sphere comes very soon with more powerful “weapon against the shadow cards”, called Burning Brand. Attached Lore hero, who defends enemy, automatically cancels every shadow card dealt to that enemy. Dark Knowledge seems after that somewhat imperfect and loses its position in behalf of Burning Brand. When I have run games without the Spirit sphere (or at least without Hasty Stroke), then I have included this attachment couple of times and try, how I feel with it, how does it work. Dark Knowledge isn’t deplorable card, we have other candidates to be really bad cards in Core set. You can find out, what bad shadow effect awaits you and therefore decide to solve the situation in another way. But with more enemies endangering you, the choice of “spied shadow card” can be wrong, you can guess the wrong shadow card and miss the true danger. Because Dark Knowledge has an effect with an uncertain result in fights with more attacking enemies (and that’s very often), the real effectiveness of this attachment suffers a serious wound. Core Lore sphere says goodbye with its last attachment, which I personally use quite often, despite its cost. Meet Self Preservation. It belongs to more expensive Lore attachments with cost 3, but in this case, I am willing to pay this cost. Note you can attach it to any character, not only heroes as we are used to at previous attachments, so I think it’s a pretty fresh change. Your character gains action, which heals 2 damage from the attached character, of course after exhausting Self Preservation. From my point of view, we have got the best healing card from Core set, namely for heroes like Glóin, who is directly designed and predestined for symbiosis with this attachment. Before I will talk about this combo, I should just specify that Lore of Imladris is also great and relatively cheap healing card (sorry Daughter of the Nimrodel, you are too fragile and expensive healing ally). Every hero can be damaged to a certain extent, which is not comfortable for you at all – 1 remaining Hit Point, for example. One-time Lore of Imladris then can fully recover your hero. However, if you plan to defend with some hero more frequently, you should demand something more permanent. For example, Aragorn is a solid defender against weak and average attacks, he has 2 Defend and 5 Hit Points. But if you plan to defend stronger enemies with 3+ Attack, then every round Aragorn loses some Hit Points and will be closer and closer to death. Self Preservation will protect him from such shameful end because healing 2 damage every round is noticeable help. And now move to my favourite combo, Glóin + Self Preservation. These two cannot exist without each other. Glóin needs to be wounded in order to generate valuable resources and Self Preservation serves to him as a shield and reliable companion. With Glóin and Self Preservation, you will forget, how looks scarce of resources. …which can send them to discard pile more easily than heroes. Self Preservation then would be discarded as well. Another danger connected with this attachment is of course vulnerability to shadow effects, which commands you to discard some attachment you control (Driven by Shadow). For these cases you should hide the “ace” in your hands, Erebor Hammersmith, who is able to return topmost discarded attachment back into a game, thus save Self Preservation. Or just include into a deck 3 copies of it. Our last Lore attachment is a great and useful piece of work. If you are thinking about some permanent healing effect, which would heal your defender (not only Glóin), then Self Preservation should be your first choice. 3 cost isn’t cheap, but the advantage overcomes the cost, I think. Heroes from last reviewed sphere are represented by a great quester and attacker in one person, by a great defender, and finally by a hero, who is able to do everything well. 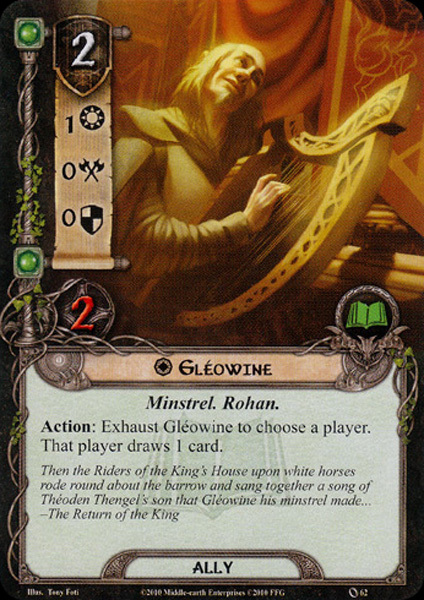 Although Glorfindel owns incredible stats, he appears in decks very rarely. The reason could be the combination of his high threat cost and quite questionable ability. The permanent healing effect isn’t bad at all, you can save a hero from close death. Anyway, because he represents the Lore sphere, where you commonly fight with resources, you often won’t utilize his ability because of lacking resources. Beravor doesn’t excel in anything – you can send her to a quest, authorize her to fulfill the defending duties or call her to the attack. It’s like she is telling you: “If you need help with anything, call me and I won’t disappoint you.” Well, the versatility is an option, how to fill the empty place. Additionally, you can enjoy her perfect ability of 2 cards drawing, what comes in handy every time. However, the ability requires the exhaustion of her and so you are unable to use her in any other actions. The answer is simple – support her with Unexpected Courage or another card with readying effect. Last Lore hero, Denethor, relies on perfect defending skills and interesting scrying ability, which definitely rules in solo games and with each next player in the game, the strength of this ability is decreasing. However, because of low threat cost and good defense, I perceive him as far more practical hero than Glorfindel. Healing, scrying, drawing cards. Choose whatever you need. Lore heroes are well distinguished each from others, and each of them is truly representing the main characteristics of this sphere, though I predominantly positively evaluate only two of them. When we look at Lore allies, we can notice one quite interesting phenomenon – you don’t find here any stat with value 2 and higher, excluding Hit Points. And what does it mean actually? If you want to find any proper action for allies, any other than chump blocking, then you will search in vain. You want to quest or attack? Then send to action either heroes or horde of Lore allies. The quantity replaces quality here. However, Lore sphere isn’t quantity-friendly sphere, because Lore always struggles with resources, more than any other sphere. Without Steward of Gondor, Théodred etc. you will hardly witness the satisfactory amount of available resources. When you succeed in playing some ally, he can’t help you really well in some effort and in order to get the contribution of at least 2 Willpower or 2 Attack you must pay 2 allies, what means on the average 4 overall cost! Because of that, Lore heroes must rely on their own stats and skills, but I think it’s wrong. Allies should be also your supportive strength. For that reason, I see Lore allies as only good supporters in other activities. Miner of the Iron Hills removes the Conditions attachments, Erebor Hammersmith returns back some discarded attachment, Henamarth Riversong scries the encounter deck, Daughter of the Nimrodel heals 2 damage from a character and Gléowine allows you to draw a card. I welcome their abilities with open arms, each of ability has own value and meaning. But if you want to search for true help in form of contributing Willpower or Attack, you should accompany another sphere. High prices didn’t avoid even Lore events. Secret Paths and Radagast’s Cunning are only 1-cost events, which you can pay almost anytime. Both have the similar effect, however, Secret Paths is the favourite of me, because with threats of locations we struggle more often than with threats of enemies, which additionally we can voluntarily engage and so get rid of some threat in the staging area. Lore of Imladris has still acceptable cost and more than acceptable effect – healing all damage from the character may resolve your temporary problem with the critically low amount of Hit Points. Other events oftentimes end in my hands completely unutilized, because I just lack more resources. Therefore, I use them as the “food” for the abilities of Éowyn, Protector of Lórien etc. Gather 3 and more resources in Lore sphere is laborious, even with 3 Lore heroes, you should save some resources for mentioned Secret Paths or Radagast’s Cunning or for some allies (attachments are either cheap or expensive, no moderate cost exists here). Lórien’s Wealth or fully utilized Gandalf’s Search have at least useful effects to some extent if you can enjoy the luxury of a good amount of saved resources. But Beorn’s Hospitality is something like a bad and very costly joke. It’s a pity that less than half of the Lore events survive in my decks beyond the Core set. I believe that many players decide to put aside the second half of the events as well. The cheaper (I would agree even the weaker) version of these unused events would have been more appreciated. For more acceptable Lore events we have to wait until next adventure packs. The Lore attachments aren’t horrible. I would say 3 of them worth for including into a deck. Forest Snare can, as the only card from the Core set, attach an enemy and immobilize him. I consider it for a great thing because you actually get the “permanent version of Feint”. On the other hand, in Self Preservation you get something like “attachment version of Daughter of Nimrodel”, but you don’t have to be afraid of treacheries like The Necromancer’s Reach. On the other hand, pay attention for shadow effects, which discard the attachments. I wouldn’t attach Self Preservation blindly to any hero, because not every hero is regularly damaged from enemies (Théodred, Éowyn, Legolas etc.). Both mentioned attachments cost 3, what isn’t the negligible amount of resources in the Lore environment. If you want to add to your deck something cheaper, Protector of Lórien will surely satisfy you with its boosting effect. Willpower is always needed and Defense sometimes as well. For proper using of this attachment, you must “feed it” by sufficient amount of the cards in the hands. The last attachment Dark Knowledge, also for 1 cost, doesn’t seem to be worthwhile, unfortunately. Not necessarily because of its penalization of -1 Willpower. The scrying of shadow cards would belong to useful effect, but with more enemies, the effect of Dark Knowledge is decreasing. Its effect is unpredictable, it can help you in the same way as it can tell you absolutely nothing. The target of your interest matters. And sometimes it’s hard to guess, which shadow card of an enemy should be scried. Actually, don’t expect some auto-included card at the level of Steward of Gondor or Unexpected Courage. However, Lore attachments can help you in a way, where attachments from other spheres cannot. Permanent healing, boosting up to +3 Willpower or Defense or immobilizing of the enemy can always make you happy. Oh my Lore, why are you so resource-unfriendly sphere? It seems like Steward of Gondor is needed here more urgently than at any other sphere. And if you somehow manage the number of resources, what will you get? To be honest, nothing strong enough to compete with the scenarios, at least not in mono-sphere mode. You will lack Willpower and Attack, the certainty and the control (or at least in the majority of your games). I consider this sphere for the supporting sphere. I’m not saying if good enough because the outcome and contribution of this sphere are arguable. Therefore I must crown the Lore sphere for the weakest one in the Core set. Heroes and attachments are the best part of Lore. Unfortunately, they can’t make it themselves, they need to support from allies and events. Though some of them worth it (Erebor Hammersmith, Secret Paths, Protector of Lórien), you still get plenty of cards, which just fill your hands and you won’t utilize them, either due to their cost or the effect.